I’ve been going on and on about my friend and work colleague Liz’s photography skills. 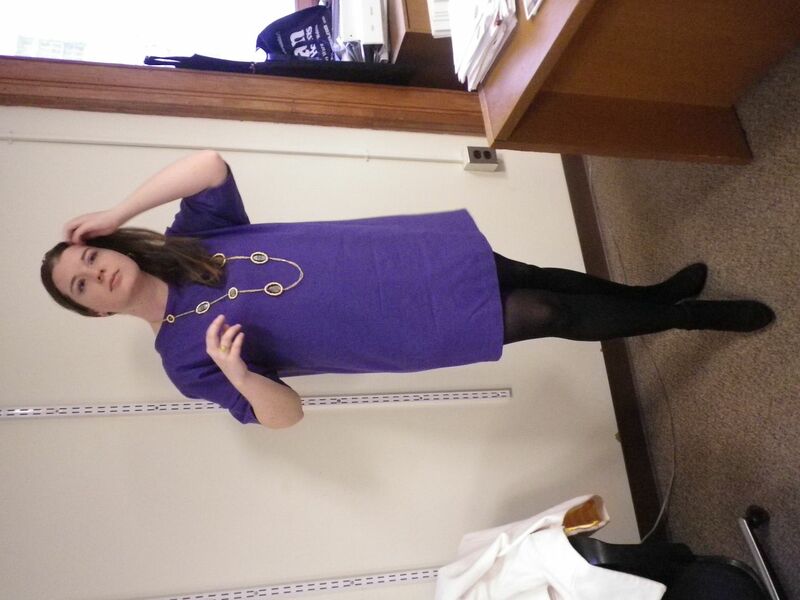 To thank her, I gifted her my Purple Friday shift dress. Liz is an actual Ravens fan whereas I am a supporter for hometwon pride and the economic impact. I did watch Saturday’s playoff game with friends and I have to say, I lost two on my nine lives. That was the most exciting football game I’ve ever seen. This week, we take on the Patriots. As I was not optimisic on Saturday, I will keep my level of pessimism on a win. But, if we lose, I can muster *some* happiness for Reethi and Ann. Do you like her little jacket too? Well, I bought this jacket on clearance last year from Old Navy. It’s like 70 percent wool and was a steal. But, it didn’t sit well on me because of my bust. She spotted it in my closet and it became her birthday gift last year. She’s also taken possesion of my amaze balls paisley maxi dress. Knowing what I know now, I see I need a FBA. So, I gave it to her too. Things have really worked out well for Liz and my wardrobe, huh? I’m glad I have a friend who appreicates my sewing and likes my wardrobe just for these kinds of moments. Above is the only garment she’s still clamoring for that I haven’t given up. She’s borrowed this cape a few times, but since I love everything about it, she’ll have to to physically pry it away from me. 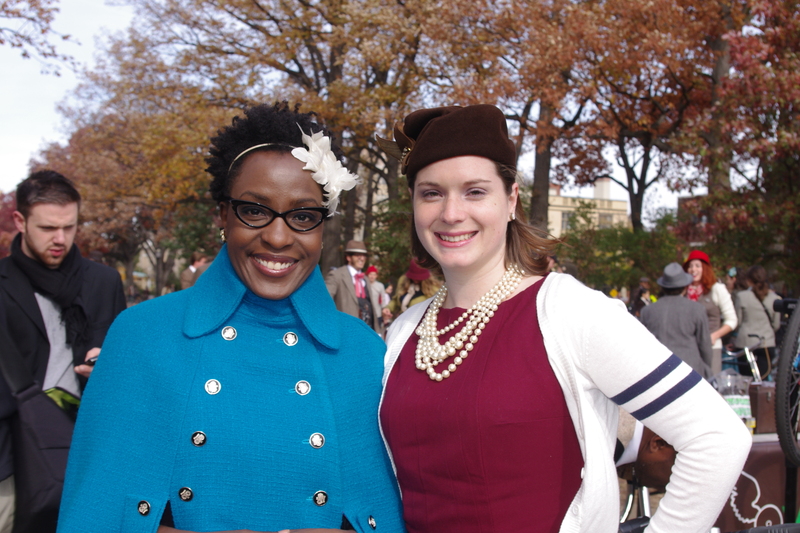 Thank you for the comments on my Oscar de le Renta cape! I’m having so much fun wearing it durnig our current warmish break here in Baltimore. Our staff photographer caught this shot of me at a ribbon cutting for a renovated historic theater yesterday. 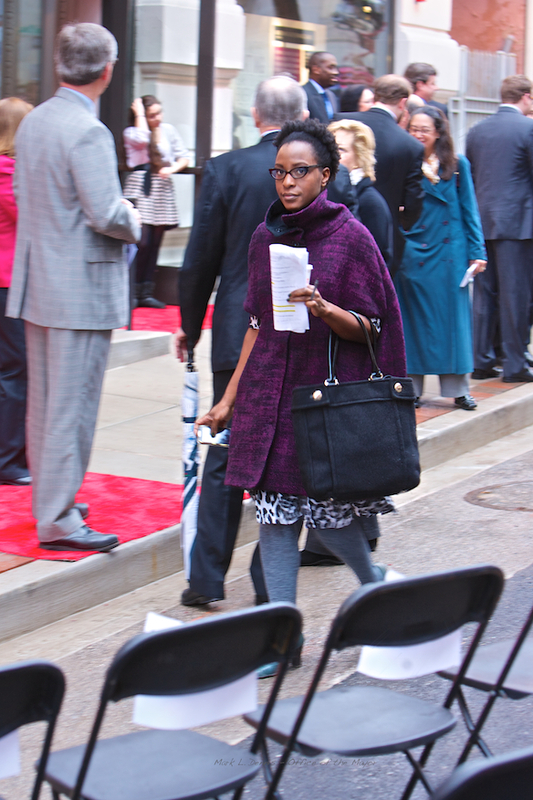 Blackberry in one hand notes and coffee in the other…..
You look fantastically chic at the ribbon cutting. You look so stylish and put together in a CANDID shot at work–amazing! How cute is Miz Liz in your hand-me-downs (admittedly, more elegant than any hand-me-downs most folk get)! And, your new outer garment looks to get hard wear from the very first, which is an excellent fate for any garment. Go Ravens! since the Panthers obviously aren’t going anywhere. Purple really looks good on you. I think I want a cape now. 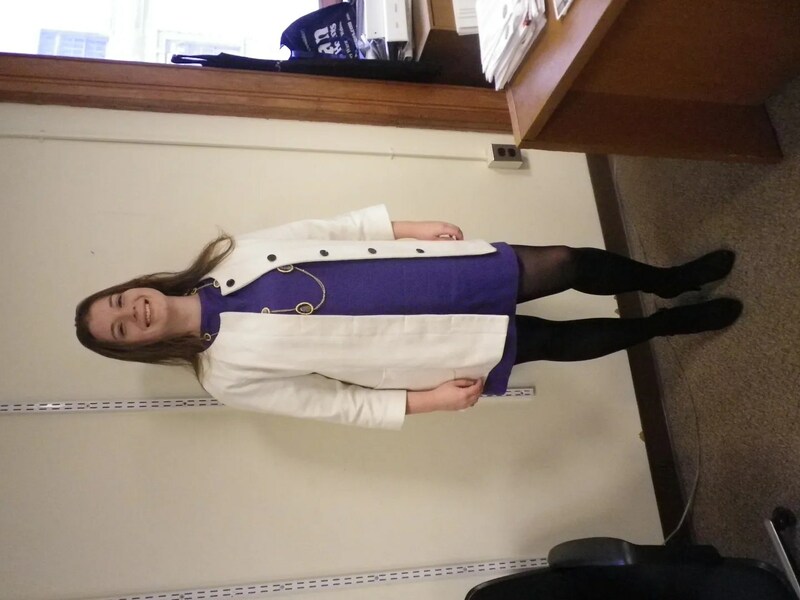 Lizzie is rocking that purple dress and you are rocking that cape! Well, I LOVE your cape. You look absolutely fab in it and very glamorous. And I love the fact that your friend loves your “hand-me-downs”. BUT, about Sunday’s game – The Patriots will have to beat you.!!!! Liz is one lucky girl but I’m worried…do you still have enough clothing left to wear yourself? That last post is very Sartorialist. Oh, if Bill cunningham were in Baltimore he would have loved your outfit. And you are a wonderful friend to lucky Liz. oh man I am loving that cape. That shot by the staff photographer is catalog material. I never wear capes but you keep making me want one more and more. What great friends you are! She does appear to benefit from your cast offs, not that I would really categorize them that way. That maxi dress is to die for, and the other items are wonderful as well. Seems to be a symbiotic relationship. I love your cape. You look so smart! So chic in the cape! Hold on to that photo. I LOVE the cape!! Which pattern did you use to make? Lucky Lizzie! I have to say, the shift does look great on her. You are making me want a cape… which I never thought could happen.